Inside this 21-page product you will find 18 ki-related feats, from Mindworm and Recenter Flow to Dream Travel and Aura Absolution, as well as 6 new spells, from paradox to steal dying breath. In addition, these tomes contain unique ki training and ability enhancement rules through the study of esoteric texts of the ancient masters, broadening the powers of qinggong while exploring the deeper connections of ki, magic, and mysticism, including supernatural acupuncture, internalization of extreme yin and yang, linkage of mind, spirit, and fate through spirit-auras, and the mortification of the flesh to span the threshold of life and death. This product is compatible with and expands upon the ki rules introduced in The Way of Ki but does not require that product for use. Download includes TWO files: a full color version AND a stripped black and white version for easy printing, both versions hyperlinked internally and to online Pathfinder resources for easy interactive reference. Available in our legendary landscape orientation for easy electronic viewing on tablets, laptops, and smartphones, as well as available in traditional portrait layout, to allow you to choose whichever best suits your needs as a gamer. Glorious meditations/grimoires with Way of Ki-synergy - what's not to like? This pdf is 21 pages long, 1 page front cover, 1 page editorial, 1 page ToC, 1 page How-to-use AP-plug-ins, 1 page author-bios, 1 page SRD, 1 page back cover, leaving us with 14 pages of content, so let's take a look! Pioneered in Legendary Games' "Tomes of Arcane Knowledge", this book contains new items, which, akin to grimoires, allow for the learning and access of new feats, spells and the like as well as coming with interesting forms and backgrounds. Taking from their "The Way of Ki"-book, they also offer a very interesting feat for WuXia-style campaigns: Ki Meditation allows you to gain a point of ki, even if your class usually has no access to ki. Also, you choose one skill, for which you gain a +2 insight bonus while thus having the ki-point and the option to spend said point for a bonus of +4. Ki determined by non-wis-mod sources are covered as well. This is vital for the book, since many of the items herein grant access/use ki-abilities - but onwards to the respective items! If all rpg-prose was written in such an evocative, eloquent manner, I could retire from checking fluff ever again. And yes, the writing remains consistently on this level. But back to the book: In contrast to other books, this one grants access to the option to learn new ki-feats beyond the benefits that having it in one's possession entails. These ki-feats are not simple reprints of Legendary Games' "Way of Ki"-supplement, instead being completely original: Absorb Aura allows you a degree of protection versus alignment-based spells and effects and allows you to infect other with alignment-auras as well as providing a way to use ki to break curses or reverse magical alignment change. Dream-Travel allows you to enter a dream-state and take others with you on your journeys through the realm of dream in a modification of shadow walking: Better yet, upon reaching your destination, wherever that may be, your bodies fade to come out where your dream-selves have gone to. Especially awesome when also combined with dream-plane-supplements like Rite Publishing's Coliseum Morpheuon/Tarnished Souk-series. Mindlink allows you to make connections between people and keep track of them as per status and if you like that idea, take Fatelink: Expanding on the mechanics of mindlink, fatelink allows for shield other to be used, even on unwilling targets, and also allow the participants to absorb e.g. the other's ability drain, poisons etc. VERY cool and a worthy "rare" fate to make questing for this grimoire a worthwhile endeavor! Object reading, detecting thoughts, modified arcane sights - the feats in this book make it interesting, fit in a thematically concise way together and make for a great read to further expand your ki-options. There are also 2 new spells, especially the latter, Paradox, which allows you to rewind one round of your actions, should make this even more desirable for any character really to get his/her/its hands/claws/pseudopods on. The necromantic instructions of Yin-blood allow the user to gain the option to cast certain spells via using ki - if you pay the price in permanent ki or the sacrifice of sentient life.When turned upside-down, this scroll instead becomes the Instructions of Thundering Yang, which works in an analogue version, but themed for different elements, granting access to other spells, feats and abilities. Glorious idea and nice to see duality and un-dichotomous morality being used this way. The Prayer of Empty Flesh and Undying Ki is a banned, heretical text that not only allows you access to a variety of different, otherwise restricted class options, the stalwart defender prestige class, new uses for ki and even 4 rare clerical spells - I you can avoid succumbing to the suicidal addicton that studying this prayer wheel. Again, a gloriously uncommon grimoire. The final item makes up the cover and represents probably the most uncommon of "tomes" herein - the 7 Ghost Needles, is a tome that requires acupuncture needles to properly benefit from its contents, enhancing your heal-skill as well as granting access to 8 special ki-feats that include the option to temporarily disable ki-abilities of foes, heal faster (or cause pain), gaining enhanced senses (deathwatch and blindsense) in a limited fashion, reduce ability scores via touch attacks, delay the onset of a couple of negative conditions, restore the blockage of ki-flow and exhibit a mastery over death and life: Finish or save, heal and restore or bleed out - the choice is yours. There also is a feat that allows you to center into 3 different ways, making you resistant and less susceptible to different classes of attacks/spells. Editing and formatting are very good, though not perfect. I did notice a minor typo/puctuation glitch here and there, but nothing serious and still on paizo-comparable levels. Layout adheres to Legendary Games' drop-dead-gorgeous 2-column landscape presentation and the pdf comes with extensive bookmarks. It should be noted that people who don't like the landscape-format may opt to purchase portrait instead. I happen to have both versions and they both are of an equal quality. Frank Hessefort's STELLAR artworks are on paizo-level, perhaps even beyond a couple of their offerings, so art-aficionados: Each grimoire gets a tantalizingly-awesome rendition. Two thumbs up! I've never made a secret out of my love for Legendary games' stellar idea of introducing grimoires to PFRPG, that is books that do something beyond teaching spells and which are characters, objects of legend of their own. This book now blends these cool concepts with their vastly expanded ki-options for an offering that should turn out to be extremely useful for any type of class, with new options, adventure- and dare I say, campaign hooks, galore. These meditations should be required and the questing goal of many an enlightened scholar and once I run Jade Regent or send my players to the lands of Heroes of the Jade Oath or Kaidan, they'll encounter at least one, probably all of these - for weal and woe. "Meditations of the Imperial Mystics" is not only a cool named book. It is a sequel to the great "The Way of Ki". While you don't require that book to fully utilize this one, it really shines with the options from the prequel. -Body Outside Body is the first tome and the one with the broadest audience, being usable by both arcane and divine spellcasters, as well as by ki users. It gives various benefits depending on your expertise, specifically 9 almost-psionically-themed feats and works as a spell book with more than a dozen spells, 2 of which are new. It feels very "yogic" to me, which is a plus if you want to make a monk who is less combat oriented. -Instructions of Yin-Blood/Instructions of Thundering Yang is an Arcane and Ki tome, being better in the hands of arcane spellcasters and ki users. The double name refers to the fact that depending on how you read it, it has different abilities to teach/enhance. A really neat idea. It focus on the idea of yin and yang, teaching, enhancing or lending abilities that focus on opposing concepts like light/darkness, cold/heat, vitality/exhaustion. However, you can only study it one way or the other. What is very special of this book is that it doesn't include anything new. Yes, no new feats, no new spells, no nothing. But it shows a really creative way of allowing characters to be acquainted with metamagic, ki and specialization of concepts. Maybe Joe the Evoker now is going to be focused in electricity/sonic spells after reading this tome, and maybe he will even grow a beard. Or maybe he will focus on cold and darkness, change her name to Jane, and maybe grow a pair of... Well, not really but I have seen to much Swordsman II with Jet Li and that is a goldmine for ideas about how to introduce this tome in your campaign. Anyway, this is my favorite item becauce of the elegance in its design. It also works extremely well with the Qiggong Monk, or can inspire the DM to include tomes like this so the character learns his Qiggong from somewhere. -Prayers of Empty Flesh & Undying Ki is the third tome, mixing Divine and Ki abilities in an interesting and flavorful way. Instead of a spellbook, it is a prayer wheel. It gives the feeling of transforming the user in a kind of undead, but not really. This tome includes 4 new flavorful spells, which the user can learn as clerical spells or Qiggong powers. One small caveat here... why not Oracle? An Oracle of Life or Bones would be really interested in learning some of these. -Seven-Ghost-Needles is the final tome, specifically designed for Ki users but flavored a bit for good clerics and other healers. This one includes a collection of 8 feats that deal with the flow of energy in the body, giving several buffing/debuffing abilities to their adepts. Another small problem here is... there are some pats, apart from the title, where the text refers to the 7 abilities... but there are 8! But well, the more the merrier. If your party doesn't have a cleric and you are interested in playing a non-divine/bardic/witcher healer, this one is for you. In conclusion, this book is worth for the flavor alone. It does thing that the authors didn't do, or didn't want to do, in the prequel. In my previous review I stated that I disliked the lack of options like spells or items in that book, but at least in those two specific cases, is covered here with elegance, panache and wire-fu. The size is again the only problem with this book, having 14 (again) pages of flavorful crunch. But 14 divided by 2 is 7 and 7 is a lucky number so you will have double the luck. OMG I'm so funny... Really... Anyway, if I had to describe this book in just one word, that would be: Enlightening. Full of flavor and awesome options for ki and spell users. 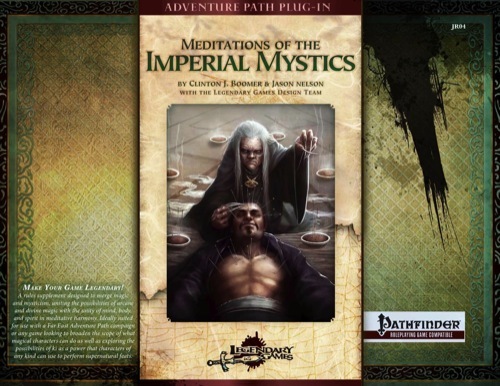 “Meditations of the Imperial Mystics” features some great cover art on the front page (1 pg), continues with 1 page of credits, 1 page of contents (also there are pdf bookmarks), a 1 page welcome note with explanation of Legendary Games Adventure Path Plugins, 2 pages describing the approach to magical tomes / base ki mediation feat, 10 pages of content, 1 page of bios, and 1 page SRD. Although I really appreciate the explanation for the Adventure Path Plugins, this review will focus briefly on the introduction to the magical tomes approach Legendary Games has established and then dive into the content. There are four unique tomes introduced in the supplement: Body Outside Body, Instructions of Yin-Blood and Thundering Yang, Prayers of Empty Flesh and Undying Ki, and Seven-Ghost-Needles. Each item description provides a flavorful item description, outstanding artwork (1/4 page in color), ritual for using the item, and a description of benefits / feats associated with the item. The benefits for each item include minor trait style benefits for performing the ritual for the item, several feats, and spells. Let’s take a quick look at each item. Features nine Ki feats and two spells. The feats include Aura Absolution, Dream Travel, Fate Link, Mindlink, Mindworm, Object Reading, Radial Navigation, Rapport, and Sensitivity to Psychic Impressions. As the titles of the feats evoke, many of these feats have a psionic feel to them - though all depend on the use of ki points. The two spells are Aura Alteration and Paradox. This item is divided into two parts through reading its scroll forwards and then backwards. Each part includes its own benefits and risks. Yin-Blood is associated with the element of cold through use of the Elemental Fist feat and metamagic feat. The scroll grants access for ki users to several cold focused spells (frostbite or icicle dagger, draconic reservoir (cold) or frigid touch as just a few examples) through qinggong monk style mechanics. Similarly, as a spell book the scroll includes the spells darkness, deeper darkness, freezing sphere, frigid touch, frostbike, ice body, icicle dagger, icy prison (individual & mass), and polar midnight. Thundering Yang is associated with the element of electricity through use of the Elemental Fist feat and metamagic feat. The scroll grants access for ki users to several fire focused spells (burning gaze or snapdragon fireworks, draconic reservoir (electricity of fire) or fire breath as just a few examples) through qinggong monk style mechanics. Similarly, as a spell book the scroll includes the spells burning gaze, daylight, draconic reservoir, fire breath, snapdragon fireworks, and sunburst. This item can be represented by fragments, notes, or in its original form a prayer wheel, which is depicted in the illustration. Its benefits reflect the cyclical nature of the wheel’s unspooling. As each associated benefit is obtained, further benefits are unlocked - as are associated risks. The first benefit is a time limited version of the feat Endurance. Users that already have the Endurance feat (and other feats associated with the prayer wheel) gain more advance temporary versions of feats like Diehard and feats in the Deathless Initiate feat tree. Similarly, ki users gain access to several spells (steal dying breath, false life, and rage against death as just a few examples) through qinggong monk style mechanics. Functioning as a spell book the prayer wheel includes four new spells including: Doom Harvester, Empty Flesh, Rage against death, and Steal Dying Breath. This item is a carefully hand crafted book that contains notes, illustrations, and woodcut and brush painted diagrams. In addition to the benefits of reading the item, time limited versions of the 8 ki feats included are available to characters. Users may also select the feats as bonus per normal selection rules once they have reviewed the book for at least a week. The feats include Block Flow, Cell Adjustment, Ebbing Flow, Invert Flow, Lengthen Flow, Recenter Flow, Restore Flow, and Switch Flow. Other than one minor typo (“creates” instead of “creatures” in the Rapport feat) the editing and formatting are very good. I found the portrait format easy to read and navigate and would assume the landscape format would be similar. The items descriptions, artwork, associated mechanics, new feats, and new spells evoke clear themes that I found exciting and interesting as a player. I cannot speak to how all GMs might use these items, but had I read this before starting the game I’m running on the boards I would have included it for sure. I’m even now trying to think of how to work some of the items in. Though the price point is on the high end as far as I’m concerned, I can’t say that I was disappointed. You pay for a 5 star product and that is exactly what you get. Woo! For anyone who wanted a follow-up to the Tomes of Arcane Knowledge or The Way of Ki, or better still a deranged and yet thoroughly fantastic love-child of the two, this one's for you! Now available in portrait mode as well. I already bought Meditations of the Imperial Mystics though I have not had a chance to look it over yet. With that said, I thought it could only be bought in Landscape, sure wish I woould have waited a few more days. with your email address, I would be happy to send you the portrait versions instead. Hope you enjoy the Meditations! 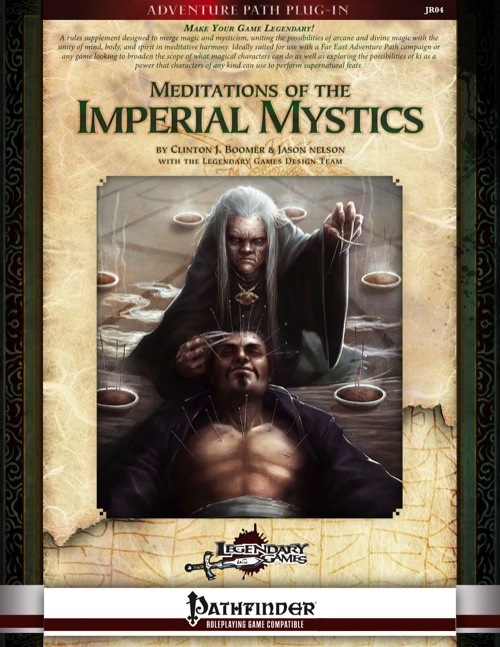 A free feat preview of Meditations of the Imperial Mystics, as well as talking about some of the design thoughts behind the kinds of tomes we created for the product. Check it out! Thanks Jason, I read over Meditations of the Imperial Mystics and will be using this product in my game as well as The Way of Ki as soon as possible. Hmm, the "makeyourgamelegendary" hotlink didn't work when I clicked on "Check it out." Maybe it's a glitch only for my machine, but thought you should know in case. Interesting. I just clicked on it in your quoted text and it worked for me. Might have been a glitch. Give it a try again, or just go past www.makeyourgamelegendary.com into your browser. One way or the other should get you there! Other than some typos I spotted (will be working up a review if someone doesn't beat me to it) I would consider this one of the best ki style products I have seen. On a side note if there ends up being more ki focused products I would love to see a print collection some time down the line. I'll probably go in and fix up the typos this weekend if I don't get a chance to do it sooner, and I'll have Tim post up the fixed files once I get it done. Once the new files are up, you should be able to download the new ones. For those interested, some additional reflections on the design of Meditations of the Imperial Mystics, specifically addressing the idea of magical acupuncture. And thanks also in this product thread to the Xiao for his detailed reviews of this and The Way of Ki! And reviewed here, on DTRPG, on d20pfsrd.com's shop and sent to GMS magazine. Absolutely awesome and a straight continuation of the all-killer-streak Legendary Games has had. Absolutely awesome and a straight continuation of the all-killer-streak Legendary Games has had. We really have strived to put the "legendary" elements into every product. From the writing to the art to the layout, we want the highest quality possible. I think Jason's done a fantastic job wrangling everything. And we all feed off each other. No one wants to be the one to drop the ball...on anything. And that's why there's more great stuff just around the corner. Thanks for the reviews, Endy. You help motivate us that much more. And we appreciate your help in spreading the word about what we've produced. Neil, you and all the other Legendary Games-contributers deserve the moniker all-star-team as far as I'm concerned. Especially since the creature codex, which is a pivotal pdf to me that marked the change from VERY GOOD offerings to stellar ones. And Endy, thanks as always for taking the time to review with your usual attention to detail. We appreciate your thoughtful and enthusiastic contributions to showing the Pathfinder community what we're all about at Legendary Games. Anyone who reads your reviews knows you don't hand out top reviews like candy; a product has to earn those stars and that coveted seal of approval. I just bought this book. It is gorgeous and very interesting, congradulation! I like the tomes and the mix of flavor and crunch they bring to the game. They certainly are original and refreshing, althought feats and more feats is a bit tired some. I would like something else, something different. Out of curiosity, how do I price the tomes inside this book if I want to incorporate them as treasure? I'm not sure how a PC getting Endurance for "free" (from Prayers of Empty FLesh and Undying Ki) is balanced. Thanks for your purchase and I'm glad you enjoyed the product! When Boomer and I were developing these tomes, we didn't worry about pricing and focused on making new book concepts (which often weren't even BOOKS at all) with a variety of new rule concepts - some feats, some spells, some oddball combinations of class abilities. If you were going to price out a grimoire, spellbooks would be priced as indicated in the Core Rulebook, and I think it's reasonable to treat new feats that you don't get as a bonus as perhaps 2nd level spells. As for actual bonus feats, judge the utility of the feats you gain. If it's a combat-useful feat, you might price it as high as 10,000 gp; if it's not very useful in combat situations (like, say, Endurance), perhaps half that. Really, there is no firm precedent in the game for the cost of feats. Some people point to the ioun stone that grants Alertness as the archetypal "cost per feat" item at 10,000, but there's not really a clear-cut standard. The best rule for pricing oddball stuff is simply to compare it to existing magic items and play a bit of the "Would you rather have this or that?" game. Compare the items where you'd pick the feat-granting book instead, and it should be higher in price than those items. If you'd pick the other item over the book 9 out of 10 times, chances are the book's price should be lower. I think I've heard Sean say a feat is generally comparable to 5,000 gp. The reason the ioun stone's Alertness runs 10,000 gp is because of the unique "slot" it takes up...i.e., without taking up a more useful slot elsewhere on the body, it's worth more in an ioun stone than any other wondrous item. The same could be said for these grimoires, however. If they're permanently granting you a feat without taking up a body slot, they should run 10,000 gp, as well. In the Ki Powers section for some of these books, there's a sentence along the lines of "These ki powers function like the ki powers of a qinggong monk, with a caster level equal to the character’s class level in whatever class grants her ki pool." But for characters who only gained a ki pool via the Ki Meditation feat, what would be their equivalent caster level? Equal to the size of their ki pool? Glad you enjoyed the product! I'd say that if a person's only ki pool comes from the Ki Meditation feat, I'd set their caster level at 1st. You might be able to persuade me that a character who had invested other resources into building ki, like the Extra Ki feat, would deserve to be rewarded with a higher ki pool, but I think tying caster level directly to ki pool has some problems as well, since there are a variety of ways of gaining more ki, some more temporary than others. I don't think you want a solution where caster level is entirely fluid. Are you guys interested in adding to or expanding this idea for ki use? In particular do you have any interest in creating a "ki caster" class to go along with these options? I know I would love to see something like a yogi who's whole focus is on ki use for powers and other interesting abilities. I do have interest in it and have a bunch of handwritten notes I made months ago, but time to work on developing them keeps getting bumped out of the way by other things. It's on my to-do list; it's just a very full list!